When I started riding a road bike seven years ago, I bought the bare minimum of gear and headed off for my weekly ride. I soon caught the bug, and started to buy more gear, but it took me a few years to settle on the items that I couldn’t really live without. So I thought it would be helpful to share my road bike riding essentials with other women to shortcut the process for others. The main thing I would stress is that there’s no substitute for a quality product and although the initial investment might seem a bit much, quality items last longer and are so much nicer to use and look at, so don’t be tempted to buy the cheapest gear you find. I wear base layers in both summer and winter. In winter my thermal base layers keep me warm and stop that cold wind from cutting through. In summer they help regulate body temperature because the base layer wicks sweat away from my skin, keeping me dry. In hotter weather I have sleeveless base layers but on cooler days I wear short-sleeve base layers which meet up with my arm warmers providing a barrier against the cold. There are plenty of companies that make women’s base layers which are the right shape for women and this is important because they are designed to be very fitted. The brands in my draw include Odlo, Craft and Giordana. I started wearing bib knicks about 18 months into my road riding infatuation, and have never looked back. I was participating in a charity ride and as part of that we were provided with a full cycling kit. I was persuaded to choose bib knicks instead of my preferred regular knicks and from that day on I’ve only ever worn bib knicks. They fit better and are more comfortable because you don’t have elastic around your waist. Like base layers there are plenty of manufacturers producing women’s specific bib knicks. My brands include Specialized, Velocio, Skins, Tineli and others. You can buy Women Who Cycle bib knicks here on the Custom Kit page. I’ve been wearing gloves from the start of my road riding but the quality of the gloves has certainly improved over the years. Gloves are really important cycling accessories and their benefits go way beyond keeping your hands warm. They also protect your hands in an accident, the padding in them takes the shock out of the road, they provide grip, protect you from the sun and much more. All my cycling gloves are Specialized brand. I wear short finger gloves in mild weather, long finger gloves in cooler weather and really warm gloves in cold weather. Gilets or wind vests are a great layer for cyclists particularly in Spring and Autumn. I didn’t discover their benefits until I’d been riding for a couple of years but once I did, I was hooked. From my experience they need to have a windproof front but a mesh rear. I made the mistake of buying one that was made of a plastic-like fabric with the same fabric on the front and the rear and when I sweated it trapped it all inside, and I overheated. A good gilet should also be very light so you can take it off mid-ride and stuff it into one of your back pockets. One of my favourites is Velocio brand which is pictured here. 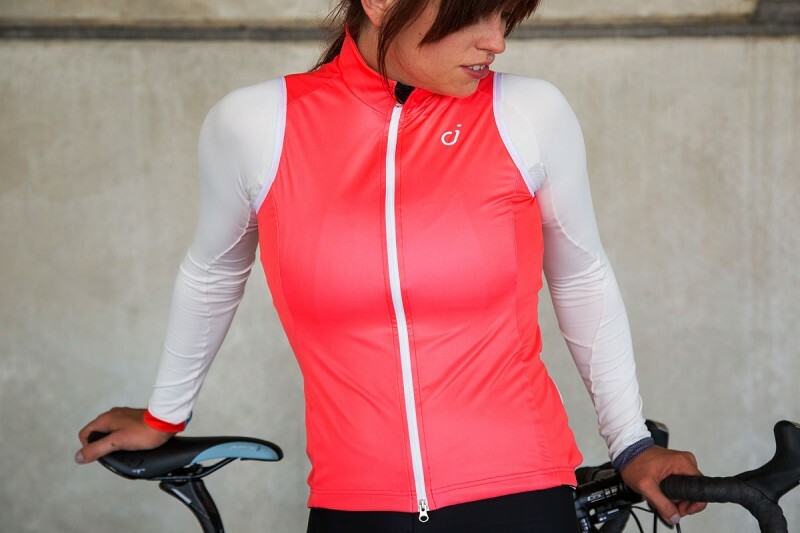 You can buy a Women Who Cycle gilet here on the Custom kit page. My first cycling glasses were very cheap, not very comfortable and thankfully they broke after about 12 months of wear. This forced me to rethink my cycling eyewear and led me to discover photochromatic lenses. These are the lenses that go darker or lighter depending on the sunlight. It means that you can leave home in the dark with clear glasses and they will gradually go darking as the sun comes up. In the early days I also tried a few rides without glasses and found that I got insects and other debris in my eyes so I thoroughly recommend you wear glasses for every ride. My current glasses are Rudy Project brand but there are many other brands that make cycling glasses with photochromatic lenses. Read my previous review of Rudy Project glasses on the Products page. Love my Rudy Project Glasses. I have transition lenses with my prescription. The cost alot but they make the world of difference. The right glasses mean you can ride day or night, rain or shine. Great list. I would just add shoe covers to the essentials. These also mean there’s no excuse in wet weather.